For this month's Random Recipes Dom set us the task of choosing a cookbook and page number for each other. He called it "I'll show you mine.....if you show me yours!". Dom paired me up with the lovely Cake Fairy. 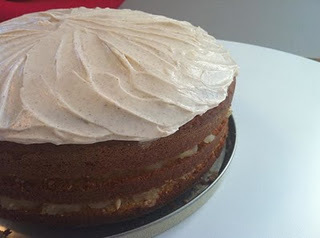 Cake Fairy hails from London and just started her blog in May. You could never tell as her blog looks very stylish and accomplished already. As you can imagine her favourite thing to do is bake and oh the delights! Let me share a few of them with you. Don't those just look gorgeous? 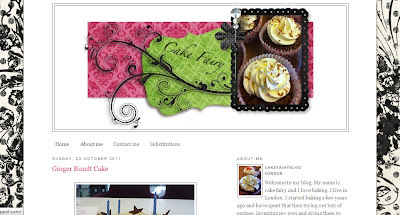 I do hope you pop over to see Cake Fairy, say hello and follow her scrumptious blog. Just in case you are interested Cake Fairy selected cook book No.4 for me and page number 216, which turned out to be Richmond Maids of Honour from Delia's Vegetarian Collection. They were absolutely addictive. I just posted them yesterday, so if you carry on at the end of this post you will see them in all there glory and can check out the easy recipe. As well as our random recipes, Cake Fairy and I decided to try a recipe out from each other's blogs. 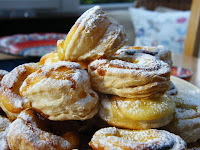 I was no hardship for me, with so many tempting baked goods to try. 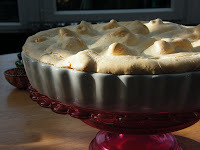 I decided to make the Key Lie Pie with Meringue. 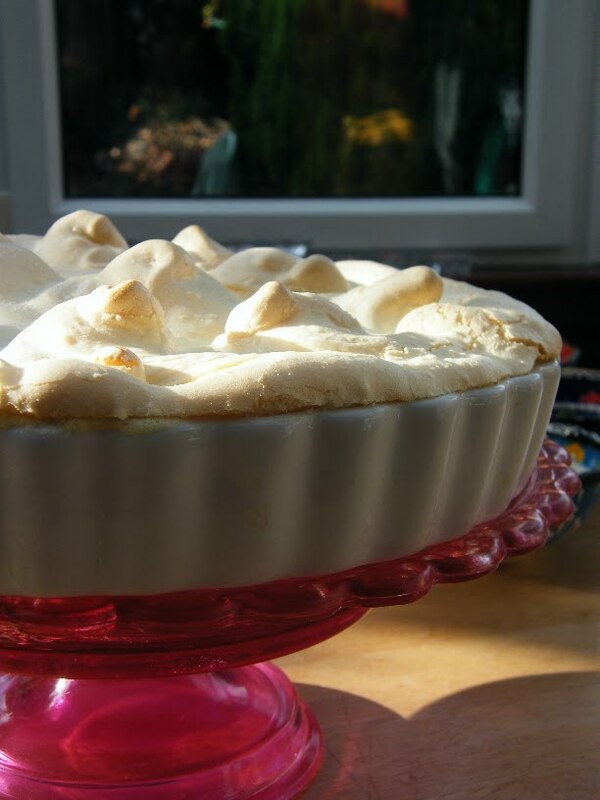 I haven't tasted it yet, well to be truthful, I did taste the ginger base as I made it and it did taste the lime topping, just to make sure it was right you understand and the meringue, well meringue is always a delight, so hopefully my meringue will be too. The pie is sitting prettily and patiently in my fridge until tomorrow night, when my best buddy Andrew comes for dinner. Written by Jacqueline Meldrum with kind permission from Cake Fairy. An easy key lime pie. A ginger biscuit base, topped with a creamy, but tangy lime layer. Made extra special by a layer of meringue on top. 1. Crush the gingernut biscuits. I recommended putting them in a bag, covering with a tea towel and crush with a rolling pin (or wine bottle!). Crush them as small as you can be bothered to as the smaller the better.2. Melt the butter in a pan on the hob and stir in the crushed biscuits. Lightly press this mixture in to a medium sized tin. Put in the fridge to chill and harden (about 30mins to an hour)3. Zest and juice the 8 limes.4. Put the lime juice into a large bowl and add the cream and condensed milk. Whisk for 1-2 minutes.5. Fold in the lime zest.6. Check your base has hardened and it is not flaky then pour the creamy mixture on to the biscuit base.7. Chill in the fridge for one to two hoursNB If you are having a dinner party it is okay to make this the night before and leave it in the fridge overnight. Cover with foil just to stop the fridge smell penetrating it. You can then top with the meringue and bake just before guests arrive. The perfect finish to a zingy key lime pie. I lurrve Key Lime Pie, it is like magic when it thickens up. The Meringue topping is an interesting addition. I thought so too Janice, although can I admit to never having tried key lime pie before? I don't quite know why. Thanks for showing me to Cake Fairy's blog - I will indeed follow - looks great. I love that you two made great use of Dom's pairing you up - lovely idea! My mouth is watering at the thought of the spicy base, the sour yet creamy filling and the sweet fluffy topping. Great idea to cook something from each others blogs - maybe an idea for Dom?? I've never done a meringue topping for key lime pie. I like the idea. I love key lime pie! You must have extreme will-power to let it sit in your fridge over night! I don't think I could do it! Thanks for a great post and a great recipe! I'm going to pop over to the Cake Fairy! It all sounds wonderful jacqueline!!! !I'll have to visit the cake fairy and oggle her recipes. MMMMMMM,..;thanks for introducing this new blogger to me! A great recipe...and also brilliant that you guys did both Random Recipes and tried out ideas from each other's blogs, that is such a nice thing to be doing! Key Lime Pie... just one more thing on my long, long list of things to make. I do like your new (or perhaps not-so-new) blog layout. Wow..perfect dessert for any time! oh wow!! will have to check it out! :) your pie looks fab! What a great looking pie, and as it happens, I already follow Cake fairy......that Key Lime Pie looks lush and I love anything that is citrus. I love, love, love key lime pie! Looks delicious. looks totally yum ! i do hope you would like to visit my event Global Food event and link this if you like ! Happy to follow you ! those cake look great - and a meringue tart always is spectacular - just hope your limes are cheaper than the ones in our supermarket yesterday!